This scenic ride heads NW through the rolling vineyards and wineries around the Carneros Wine Region for a climb up Lovall Valley in Sonoma. Return east through on Ramal Rd for a couple of out & back spurs to Skaggs Island for possible bird watching around the wetland and marshes followed by a jaunt on Milton Rd to Napa Valley Marina at Edgerley Island. Begin this ride from the corner of Golden Gate Dr & Stanly Ln in Napa. Head south on Stanly Ln for a leisurely roll through the beautiful Stanly Ranch vineyards. Continue through the vineyards on Stanly Cross Rd. Exit Stanly Ranch onto Cuttings Wharf Rd to Las Amigas Rd. Las Amigas Rd heads west through the wineries and rolling vineyards around the Carneros region before coming to a T at Duhig Rd. Head south on Duhig Rd to Ramal Rd; the road continues westward into Sonoma County through the gorgeous vineyards around the Carneros AVA and the blooming mustard fields. Meander around the country ranches and rural homes on Acacia Ave to S Central Ave and Knob Hill Rd. The turn on Burndale Rd takes you through the valley vineyards and ranches along the east edge of Sonoma. Denmark St continues west through the landscape of vineyards towards the town of Sonoma. 7th St E rolls through a beautiful upscale neighborhood along the east side of town to Lovall Valley Rd. Lovall Valley Rd begins with a easy stroll through a rural countryside neighborhood. This quiet back road winds its way up around the north side of Arrowhead Mountain towards Wood Valley with 6-8% grades. It continues uphill to the gorgeous foothill vineyards along the Sonoma wine trail at Favero, La Class and Forsythe Vineyards. Lovall Valley Loop Rd is relatively flat with beautiful views of the foothill valley vineyards and hillsides. Return along Lovall Valley Rd and meander on 4th St E and E Spain St towards the Sonoma Plaza area on 1st St E.
Exit Sonoma Plaza and continue east for a jaunt through the residential neighborhoods to the outskirt of town on E Napa St.
Retrace your steps on 7th St E to Denmark St.
Take Burndale Rd back to S Central and Acacia Ave.
Return through the Carneros AVA vineyards on Ramal Rd. 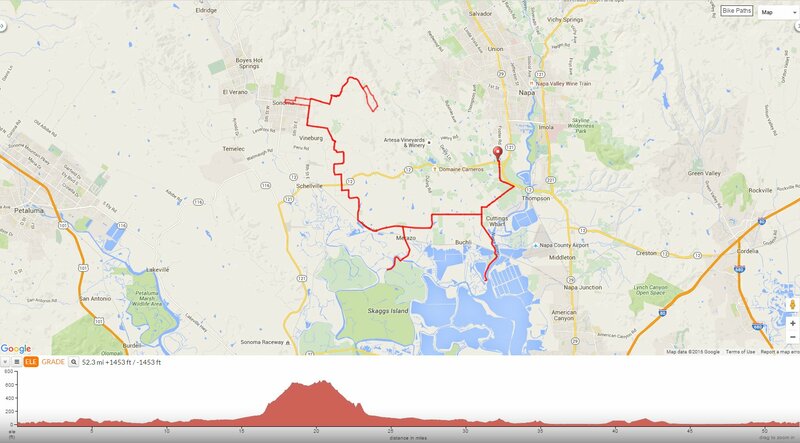 Head south on Skaggs Island Rd for a short out & back segment through the vineyards and ranches towards Skaggs Island. Cross Hudeman Slough for a quiet scenic ride along Second Napa Slough. The road comes to an end at a gated fence-turn around and make your way back to Ramal Rd. Continue east on Ramal Rd; the road changes to Duhig Rd as it curves around the valley into Napa County. Return on Las Amigas Rd eastward through the magnificent wineries and colorful vineyards! Head south on Milton Rd; this out & back segment takes you out to Napa Valley Marina with expansive valley views west of the Napa River. Milton Rd continues to Edgerley Island behind the waterfront homes along the Napa River. The road comes to an end at a wildlife preserve marsh area. Continue on Stanly Cross Rd back through Stanly Ranch for the return to Stanly Ln and Golden Gate Dr. This is a wonderful ride along the quiet country back roads through the gorgeous rolling vineyards around the Carneros Wine Region from Napa into Sonoma-the added loop up around Lovall Valley is a great little bonus climb! For a change of landscape, take the roads less-traveled and explore the out & back segments on Skaggs Island and Milton Rd. Weather: Partly sunny and warm. Temps ranging from the high 50’s to the low 70’s with NW winds. I did this ride for the first time today and the scenery was absolutely great with large clumps of California poppies blooming in the fields. I came across a neat diner called the Fremont Diner on S Central Ave. and CA12. I also stopped by the Basque Boulangerie but there were so many people in line so I went to the Irish bar on the same block. Thanks for providing this ride route! I’m going to do this ride again. Yoshi, Excellent-so glad you enjoyed the ride! It’s a beautiful time to be out there with all the wildflowers and green hills!